Bitcoin: the New Gold or Money of the Future? In this article i explain why we need cryptocurrencies. I present the arguments advocating for and against bitcoin and eventually I examine whether Bitcoin is the new gold or the currency of the feature. I conclude that at best, Bitcoin is currently a store of value. At worst it is just a speculative asset. You have probably already heard about Bitcoin and cryptocurrencies. It is hyped a lot lately and there is a lot of exuberance in the market as a result. This article therefore is meant to be a more balanced, realistic examination of Bitcoin. I will first go into why cryptocurrencies were ‘invented’ in the first place. I will then present the strengths and weaknesses of Bitcoin. Finally, I will critically examine the question at hand: Is Bitcoin the new gold or is Bitcoin the currency of the future? Bitcoin is digital money that is transferred and registered on a distributed ledger. In other words, it is a cryptocurrency. The idea of cryptocurrencies has been around for long, but most people do not know why this idea is so attractive to some. There are a number of reasons why the concept of cryptocurrencies might make sense in our day and age. I will present the most cited arguments made by cryptocurrency enthusiasts. Firstly, most money is digital already. Economists estimate that only 8% of the world’s currency exists as physical cash. The difference between cryptocurrencies and normal currencies is therefore not as big as people might think. The difference is one of control and centralization. Today, banks keep track of most of people’s balances. This creates central points of failure if the banks’ servers are not properly secured. 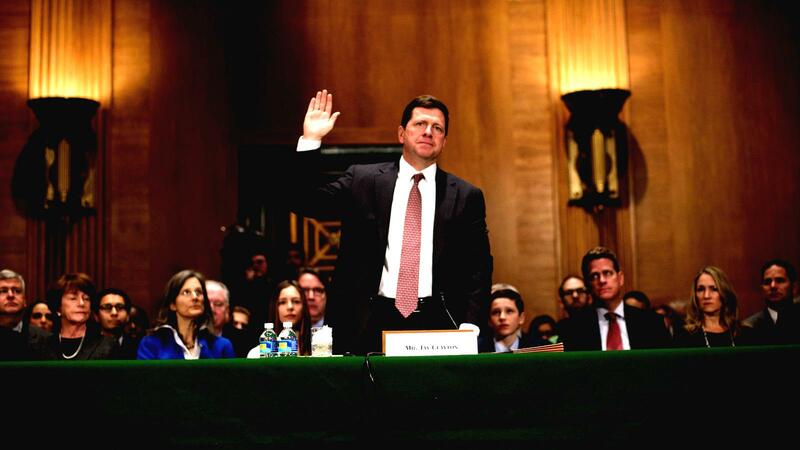 Trust is placed in banks to ensure this security, but banks are run by people and people are far from perfect – nor are they immune to moral hazards. In our current system, there is no separation between retail banks and investment banks. Banks are allowed to engage in the investing of their customer’s money. They are only required to keep a fraction of the deposited money as reserves. Due to this widely practiced form of banking, customers are subject to the risk banks take. Centralization around banks also makes it easier for governments to control money-flow through censorship. Authoritarian governments participate in such censorship on a large scale. I often hear the argument that this factor should be disregarded in states with a strong rule of law. However, censorship is not unheard of here either. Take for example the fact that Mastercard, Visa and PayPal started blocking donations to Wikileaks. There was no legitimate decision by democratic institutions underlying this blockade. Instead, we can only assume there was political pressure to do so. Although our monetary system is centralized around banks, there is no single harmonized data system (or ledger) for all banks. Each banks keeps track of the customer’s balances and transactions in their own system. Instead, they each use a slightly different technical infrastructure for this. Thus, there are technical hurdles for sending money from one bank to the other, resulting in the need for intermediary payment processors such as the SWIFT system. In turn, this results in high transaction costs and delays. Moreover, central banks control money supply and market supply by printing money and changing interest rates. Take as an example the European Central Bank’s quantitative easing to keep interest on southern European state obligations artificially low. Inflation is unpredictable in traditional currencies and will very likely continue to be, despite of efforts to keep it stable. Despite all of this, the most important raison d’être for cryptocurrencies is that people are fed up with the current system. They are fed up with institutional risks. Fed up with government debt. Fed up with fractional reserve banking and central banks in general. Mostly, people are fed up with financial crises, which they feel the consequences of, while the people causing them seem to escape all responsibility.In most cryptocurrency communities there is a belief that our current debt-based society will inevitably collapse – leading to mass inflation in fiat currencies. People are scared that their money will lose its value, as the gold standard has been long abandoned. Bitcoin provides a way to escape this risk. It is no surprise that Satoshi Nakamoto’s white paper on Bitcoin was released mere days after the collapse of Lehman Brothers. For all the reasons above, it is not inconceivable that people might want to be in control of their own money. However, not a lot of people want to put cash under a mattress. As of now, banks are needed because they are the most trustworthy solution to store our money safely, and we have designed legislation to make them as trustworthy as possible. However, what would happen if people could place their trust somewhere else? Somewhere where all the risks cited above do not exist? The idea of digital currencies has been around since the ‘80’s – far before Bitcoin. Blockchains and peer-to-peer systems existed before Bitcoin as well. The real innovation that Bitcoin brought was the Proof-of-Work consensus mechanism that makes Bitcoin’s blockchain trustworthy. Bitcoin is, as defined by Satoshi Nakamoto, a peer-to-peer payment system. All Bitcoin balances and transactions take place in the same system: Bitcoin’s distributed blockchain ledger. As such, there is no need for intermediary parties to take care of payment processing. Transactions are recorded and executed directly on the blockchain. In order to understand how, we have to understand what the blockchain is. A blockchain is a distributed database. It consists of virtual ‘blocks’ that are filled up with data. Once a block is filled with transactional data, it is added to the chain and it can never be altered again due to high levels of encryption. Each block has a timestamp that links it to the last block and as such a chain forms. Data that is stored in a block will be a part of the blockchain forever and is completely immutable due to advanced cryptography. This immutability makes the blockchain viable as a ledger to keep track of who owns what. Bitcoin’s blockchain always contains all balances of all users. It does this by registering all transactions ever made in its blocks. One can theoretically go back and trace a Bitcoin from the moment it was created. Let’s say Alice sends Bob 1 Bitcoin (Tx 1). She sets up the transaction and digitally signs it. The transaction data and her digital signature are together registered as a hash (Hash0) in the block’s merkle tree. The merkle tree is just a data structure to easily include all transactions without taking up too much space. 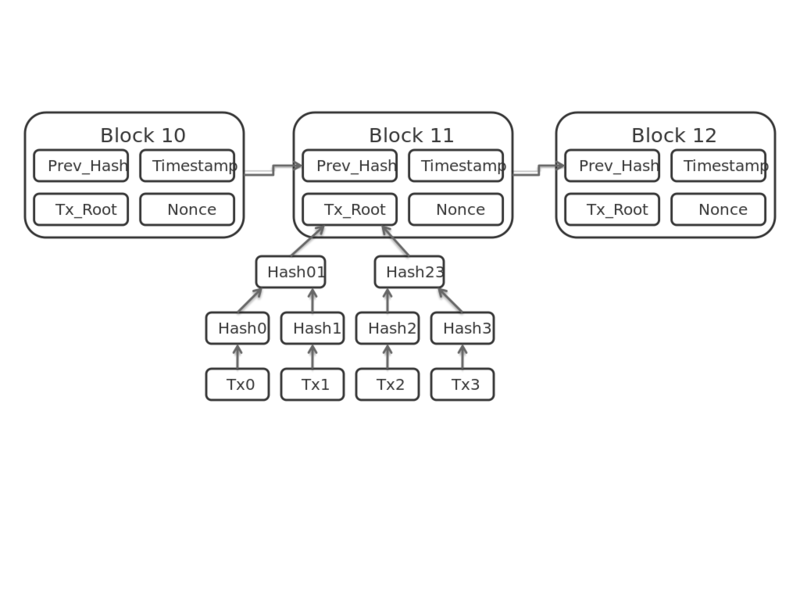 The root of the merkle tree is included in block 11 and will be part of the chain forever. To verify that this transaction has happened, one can check block 11 in the blockchain and then to find a transaction of 1 BTC from Alice to Bob in the merkle tree. To properly verify whether this transaction ever occurred, the blockchain has to be publicly available and trustworthy. To this end, a complete and up-to-date copy of the whole blockchain is stored and made available by a large number of computers (nodes) worldwide. These same nodes provide make the network secure by verifying if transactions are valid through a consensus protocol called Proof-of-Work. In Bitcoin, there is no need to trust third parties with your money. In other words, Bitcoin is ‘trustless’. All transactions are executed by and on the blockchain itself. There are no additional parties between the sender and the receiver of funds. Bitcoin is, as described above, decentralized. This decentralization makes Bitcoin extremely secure. The ledger that keeps track of your balance is secured on thousands of nodes instead of one centralized server. In other words, a malicious party would have to hack thousands of computers on the same time, instead of one single server. Bitcoin’s decentralization also makes it impossible to censor transactions on the Bitcoin network. This is because to do this, a government would have to convince 51% of all the computers in Bitcoin’s global network to not allow a block with a certain transaction in it. Moreover, Bitcoin is very useful to make cross-border transactions. Conventional payment processing take 3 to 5 days on average, whereas a Bitcoin takes 10 minutes to be confirmed. Transaction fees to do this are also substantially lower, which makes Bitcoin very useful for remittances. Another advantage of Bitcoin is that it’s inflation is 100% predictable. Only 21 million Bitcoins will ever be created, with about 16.5 million currently in circulation. New Bitcoins are introduced to the market through block rewards. Miners (nodes that add a block to the chain) currently get 12.5 Bitcoin per block added. This reward is reduced periodically until 2022, after which miners only receive the transaction costs of all transactions in a block as reward. Lastly, it is often argued that Bitcoin is anonymous. I would argue that this is not at all the case as one can track all transactions that have ever occurred in the blockchain. To know who really made the transaction however, one would have to be able to link the ‘sending-wallet’ to an identity, which can prove difficult. However, this would make Bitcoin ‘pseudonymous’ at best. Although Bitcoin was designed to be decentralized, it barely is in practice due to the centralization of mining. Mining becomes increasingly difficult and the blockchain becomes larger in size, making it impossible for the average user to mine blocks. As mining becomes more and more difficult while energy costs stay the same, only big parties with large amounts of capital to afford the GPU’s and electricity costs can mine profitably. Centralisation leads to increased risk of censorship and mining cartels (51% attacks). Transaction fees have risen as the total number of transactions per second has risen while the network’s capacity to add them to the chain has not. At the moment there is huge disagreement in the Bitcoin community about how to deal with this. The problem is that incentives for miners and users do not align completely. Miners don’t care about centralization and just want more transactions on the network so they receive more transaction fees. Their solution to deal with increased use of the network is to increase the size of the blocks so more transactions can fit in them. Users and developers on the other hand are worried that this leads to more centralization as bigger blocks would make the blockchain’s size in Gigabytes increase even faster. This would, in turn, make it even more difficult for users to run their own full nodes. Instead, the developers believe that other technical solutions (SegWit, Lightning Network etc.) could potentially also solve the network’s capacity problem. Whichever side of the debate you support, it is clear that Bitcoin is dealing with governance issues. This is increased by the fact that there are multiple ways to try and make changes to the network. The ‘big block’ camp has even forked off into a new blockchain called Bitcoin Cash through a so-called hard fork. In other words, at some block on the 1st of August, a part of the miners made a copy of the blockchain until that point and started mining bigger blocks on it. Now, both chains are functional and there are two different Bitcoin’s. Think of it as your Euros splitting up into Euro and ‘Euro Cash’. You get to keep your Euros while also receiving the same number of Euro Cash. Although this might seem like a nice deal, this obviously creates difficulties. Will your original Euros be worth the same after this? And will people accept your ‘Euro Cash’ as payment? To answer this question, we first have to know what money is. Money was invented to make it easier to trade goods and services. Without it, any purchase would need to be paid with other goods or services in return. To be functional, money has to have three intrinsic qualities. Let’s see if Bitcoin meets these criteria. Bitcoin can be used as consideration in exchange for goods or services. However, the amount of shops actually accepting bitcoin as payment is still extremely low. Moreover, most people I know would not accept bitcoin if I owed them money. Market penetration is still very low. In fact, an extremely small percentage of all transactions on the Bitcoin network is actual usage as a medium of exchange. The vast majority of transactions is speculation on the price. As a unit of account, Bitcoin has an advantage as compared to fiat currencies. In both there is a standard of worth that everybody agrees upon at a certain date and time. However, Bitcoin is more divisible. The minimum division of a euro is a euro cent, while Bitcoin’s is 1 Satoshi, 0.00000001 BTC. Although it never happens that you want to pay for something worth less than 1 euro cent, this might be a big advantage in the future. Imagine selling a person’s data collected by an Internet of Things device. Or imagine that you automatically pay the writer of a news article when reading it. Although this lies beyond the scope of this article, microtransactions might become more prevalent in the future. Money has to function as a store of value. It can be stored to shift purchasing power from the present to the future. In other words, money has to allow for saving. This is both the most debated and most interesting property of Bitcoin. If you believe that a store of value should be stable in value, Bitcoin definitely does not meet the criteria as it is extremely volatile. Between June 12th and July 16th Bitcoin almost lost half its value. However, on a larger scale, Bitcoin has only appreciated in value. In fact, it has been the best store of value in the world since its inception. 100 Euro in Bitcoin back in 2011 would now be worth close to 1.6 million. However, results in the past are not a guarantee for the future. Not if you ask me. It is barely used as medium of exchange, as it is as of yet not widely accepted as a means of payment. Most transactions are of a speculative nature. Moreover, Bitcoin’s value is currently way too volatile to function as money, as it is not a reliable store of value. Gold has a track-record – we have believed in gold’s value for thousands of years. Gold can be used in jewelry, electronic chip manufacturing etc. So to say that Bitcoin is the new gold is naive. 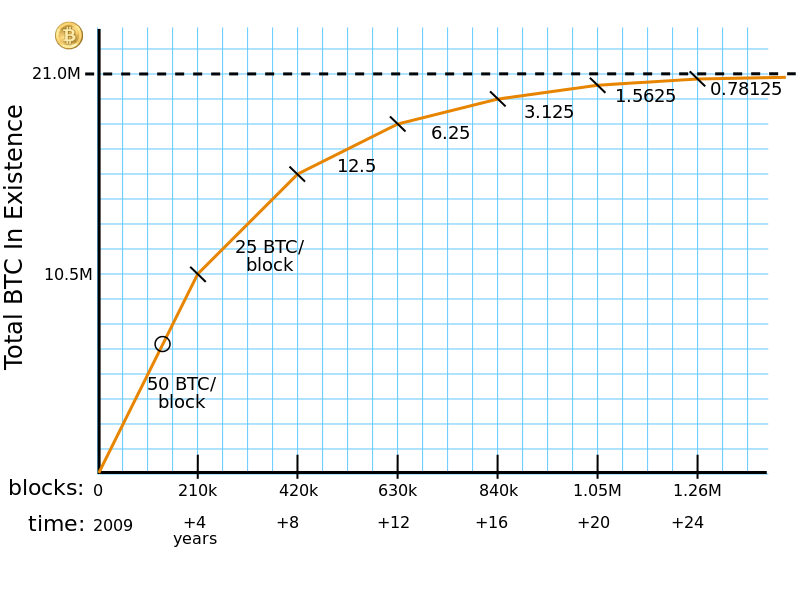 Bitcoin’s value has not been tested through time and it has no intrinsic value. People that believe Bitcoin’s intrinsic value is found in the advantages of the underlying technology are plain wrong, as the technology is easily replicable. Bitcoin’s underlying ideals however will make it a likely hedge during a global economic downturn. In a scenario where everything goes down the drain, Bitcoin will most likely thrive. So is bitcoin the money of the future or the new gold? Still, as long as Bitcoin is not used as money, I will personally not consider it money. The Bitcoin network is currently completely incapable of handling high numbers of transactions per second. The technology is still in an early stage of development and should be understood as such. At best Bitcoin is currently a store of value. At worst it is just a speculative asset. This is not to say that Bitcoin will never be the currency of the future. If enough people start adopting Bitcoin to transact, network effects might do the rest. I am in no place to make a guess towards the probability of this occurrence. I do however believe that this probability will inevitably depend on the likelihood of people identifying with Bitcoin’s underlying ideal: independence from the current financial system. As such, it will be very interesting to see what happens to Bitcoin during the next financial crisis. Bitcoin will never replace gold, but might act as a more volatile hedge against economic uncertainty. If you read this far, I hope you found the information above valuable. And although the future of cryptocurrencies is interesting, blockchains allow for a far wider arrange of applications. There is much, much more that is possible. In my next posts I will delve further into this. I will examine the potential of smart contracts, Initial Coin Offerings and Decentralized Autonomous Organisations. These concepts enable far more use cases and will most likely have bigger effects on our economy as a whole. But cryptocurrencies are not the most interesting application of blockchain technology. There is much, much more that is possible. In my next posts I will delve further into this. I will examine the potential of smart contracts, Initial Coin Offerings and Decentralized Autonomous Organisations. These concepts enable far more use cases and are far, far more interesting than cryptocurrencies.